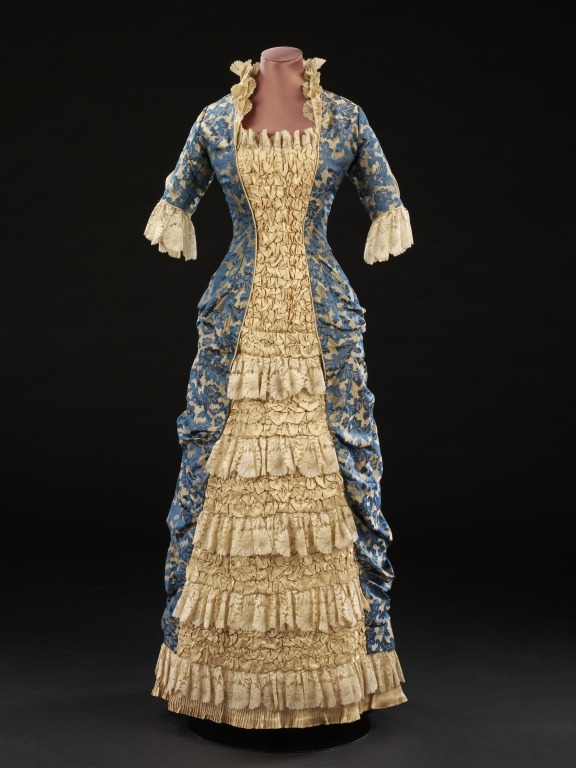 During the late 1870s the fashionable female silhouette changed. It moved away from the exaggerated padding provided by the bustle (a device worn under the skirt to push it out) to sheath-like dresses that emphasised the natural shapely curves of the body. Princess dresses, like this one, suited this style particularly well. The bodice and skirt were cut in one piece with no seam at the waist. This construction created a long narrow line and a smooth fit over the contours of the bust and hips, accentuated by the figure-hugging corsets worn beneath. The fitted look was also achieved by cutting the bodice with five seams at the back and inserting front darts that curved in at the waist and then out again. The bodice was often fastened at the centre front or, as in this example, with a concealed hook and eye closure on one side. 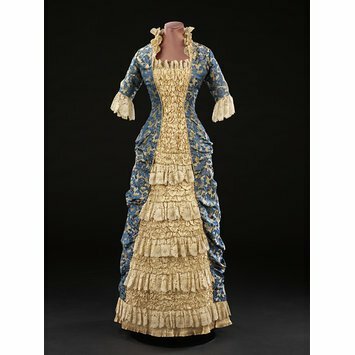 Princess dress of blue and gold Jacquard-woven silk made with a fitted bodice and narrow skirt drawn back into drapes at the back. It has elbow-length sleeves and a square neckline, which are both trimmed with machine-lace.